Professor Laura Miller-Graff teaching a class. Photo by Matt Cashore/University of Notre Dame. 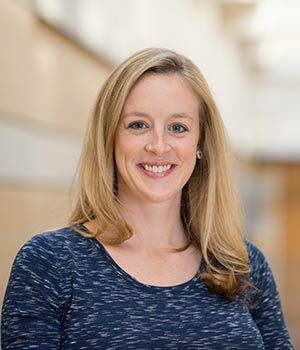 William J. Shaw Center for Children and Families Assistant Professor of Psychology and Peace Studies Laura Miller-Graff led a novel study examining the role of breastfeeding as a potential protective factor against detrimental outcomes for infants associated with IPV during pregnancy. Miller-Graff and her co-author, graduate student Caroline Scheid, found that breastfeeding through the first six weeks of life acts as a protective factor, effectively negating the risk of IPV the mother experienced during pregnancy on early infant difficult temperament. Poor temperament — from fussiness to being unable to soothe themselves — can be an indicator of adjustment issues in early childhood. Earlier research conducted by Miller-Graff and other colleagues showed that, while victims of IPV are not less likely to initiate breastfeeding, they are far more likely to cease the practice in the first few weeks after birth (add link). “Together these studies suggest that providing IPV-exposed women with more targeted breastfeeding support may have important public health implications,” Miller-Graff notes.